Final Update for 2004, see you next year! Complete history of this remarkable wreck, and interview about its recovery last month. Reported Last Update, Returned to Grateful Veteran! An amazing story! Discovered at a former wartime airfield, the tag appeared on PacificWrecks and was returned to the veteran, learn this remarkable tale! Rifle company commander company I 155th infantry regiment. Served in Western New Guinea and the Philippines. Exploration of the history and rediscovering the locations of the Australian costal defense batteries. Happy holidays & New Year. Welcome to the final PacificWrecks update for 2004. This month's update is full of exciting news stories, interviews and reporting. As always, thank you to contributors worldwide for new, links and information. Foremost is the recovery of one of the most intact P-47 aircraft wrecks known in the Pacific, including all facets of this story: its recovery, photos of the site and an interview with the former pilot, and questions about its pilot who is still listed as an MIA. PacificWrecks needs you! Due to overwhelming usage of the site, (averaging 2,500 unique visitors daily!) We need your support! Consider making a donation to the this non-profit project, for additional server space and keep this free resource growing. The most intact Thunderbolt wreck known in the world was recovered in early October by an American businessman and Australian salvager. Only problem: the pilot is still listed as Missing In Action. History of the Thunderbolt. It flew with the 49th FG, before being transfered to training role. Flown by J.W. Harris and lost while being flown by Marion C. Lutes, from the 312th BG, who went MIA on this flight. First discovered in 1979 in remarkable condition, the wreck remained where the war left it until this October 2004 when it was recovered to Australia. Interview with Robert Greinert, the man responsible for the recovery of this P-47 this October. 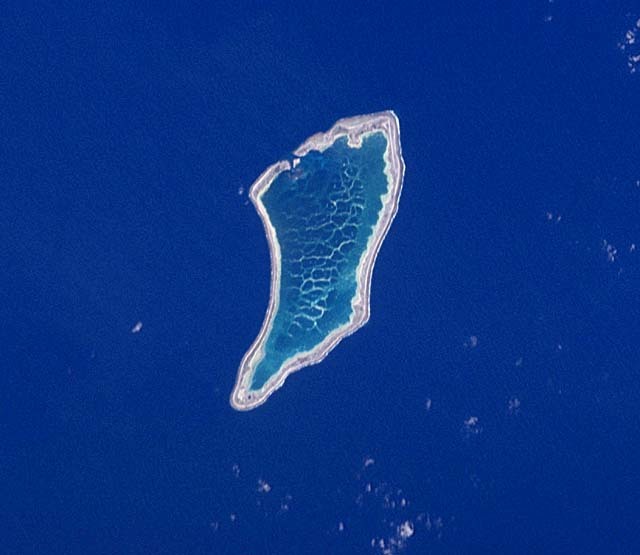 Although he rarely does interviews related to his aircraft recovery work, Greinert has been involved with airplane wrecks in Australia, Vanuatu, Papua New Guinea and acquiring in other countries. Learn about his side of the story, why the wreck was selected for salvage, how he feels about its MIA pilot, and what will happen to this aircraft in the future. This Thunderbolt's first pilot, J.W. Harris of the 49th joins the discussion with an interview about his wartime service, and feelings about the recovery. An amazing story! Discovered by Henry Mayer at a former wartime airfield in Port Moresby, the tag appeared on PacificWrecks and was returned to the living veteran, Gurden Barnett. What a Christmas Present! 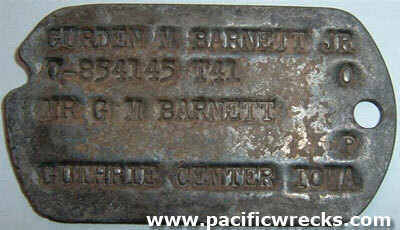 Learn about Barnett's wartime history, and the remarkable tale of this metal tag, now returned. Phil Bradley - Author of "On Shaggy Ridge"
Long time collaborator to Pacific Wrecks, Phil Bradley is now an author, with his critically acclaimed book, "On Shaggy Ridge" published this year, about the Australian Army battle in New Guinea for this pivotal terrain feature. He shares his experiences writing, researching and traveling to this historic but forgotten battlefield. Also, spectacular 'then & now' photography of the features of the battlefield. Rifle company commander company I 155th infantry regiment. Served in Western New Guinea and the Philippines. 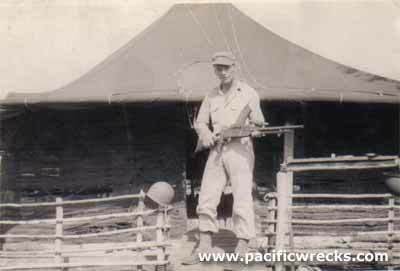 He shares his memories about the forgotten fighting in Western New Guinea, Philippines and photos from his personal collection. by John Douglas. Most people who dwell in Port Moresby are only vaguely aware of the concrete structures to be found on Paga Point. They are the remains of a coastal gun emplacement built in the desperate early years of WWII; when all threats off danger seemed magnified and urgent, defensive measures were called for. by Phil Bradley. Tells the story of one of the most remarkable campaigns in Australian military history. This latest volume in The Australian Army History series details the dramatic but little known story of the 1943-44 Ramu Valley campaign in New Guinea. Drawing on extensive records that are brought to life by the vivid recollections of over 140 veterans, and illuminated by the author’s own journeys to the region. Tired of seeing those same sequences of air combat repeated in nearly every television documentary? Here is the answer: Rare Aviation's Corsair Versus Zero DVD. This release shows spectacular COLOR gun camera footage from F4U Corsairs in the Pacific. For anyone interested in dogfights and air combat, this release is not to be missed! What Pacific WWII Books Are You Reading? Submit your review of Pacific WWII related books, videos or other publications. anything, new or an old from your bookshelf. All reviews are credited.